Delft, Netherlands—May 14, 2007—OCZ Technology Group, Inc. (LSE: OCZ), a worldwide leader in innovative, ultra-high performance and high reliability memory, today announced the OCZ PC2-8500 AMD CrossFire™ Reaper HPC Edition. As some of the highest performing modules on the market, the PC2-8500 CrossFire features the exclusive OCZ CrossFire edition Reaper HPC heatsink for advanced component cooling. Tested and qualified under AMD’s renowned certification program, the PC2-8500 CrossFire series not only meets a high standard of quality, but guarantees superior compatibly with CrossFire technology. Combined with AMD’s esteemed CrossFire technology, the OCZ PC2-8500 certified series unleashes the performance potential of the entire platform. AMD enthusiasts and system builders will love the customized look of the new Reaper kits; these modules are cooled with an exclusive AMD special Reaper HPC (Heat Pipe Conduit) heatspreader displaying AMD’s “CrossFire Certified” emblem. 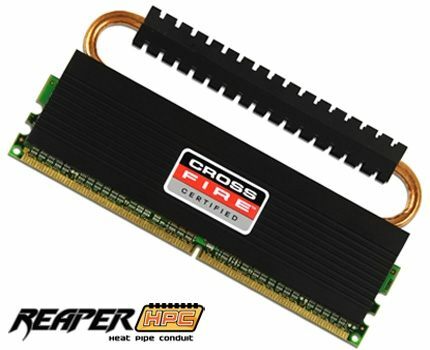 These unique DDR2-1066 modules feature the Reaper HPC (Heat Pipe Conduit) heatspreader which is engineered to deliver superior silent heat dissipation over traditional heatspreaders. The Reaper HPC is an innovative cooling solution developed by OCZ to effectively minimize heat produced by high-speed memory. As heat rises into the thermo-conductive copper heat pipe conduit, it is dissipated through a compact aluminum fin array. By strategically guiding performance-robbing heat away from key memory components, the unique Reaper HPC design maximizes passive cooling to improve longevity and stability of the modules. The first certified Reaper HPC memory product available will be 2GB (2x1024MB) dual channel kits optimized for the latest CrossFire platforms. Rated to run with 5-5-5 timings, these modules offer gamers an additional performance edge over conventional DDR2-1066 memory. The CrossFire Certified Reaper 2GB kit is the supreme solution for gamers seeking the advantages of increased reliability and bandwidth management from their memory. Each OCZ PC2-8500 CrossFire Reaper module is backed by an industry leading OCZ Lifetime Warranty and technical support for unparalleled peace of mind.